It might seem early in the year to think about it, but the publishers already are: Saturday May 4th is Free Comic Book Day, when various publishers put out special “sampler issues” to be given away at comic book shops across America. 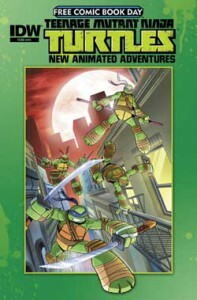 First up, IDW Publishing have announced a new full-color tie-in with the hit Ninja Turtles CGI series, featuring art and stories by various people and a color cover by Dario Brizuela. “Jumping from screen to page, it’s Teenage Mutant Ninja Turtles New Animated Adventures! This unique series captures the heart of the smash Nickelodeon television show with brand-new stories. Full of action, excitement and laughs, this is the perfect all-ages comic to get you seeing green! !” Check out more of what’s coming on Free Comic Book Day by visiting the official web site.